With all of that effort behind each and every article, it just makes sense to maximize the return on the effort by increasing the reach, influence and impact of successful placements. Too often, however, PR and marketing departments see the placement itself as the end goal, and once it has been achieved, move on to the next without taking a few extra steps to drive even more results from a single bylined article. Are you missing opportunities to turn a single contributed article into much, much more? Consider each of them a one-off project. In years past, contributed articles may have been strictly a tool for public relations, meant to build a brand identity, develop a reputation of industry leadership for corporate executives, and influence general public opinion of the company. Thought leadership placement was disconnected, both in practice and in the public view, from marketing or advertising that was focused on a brand’s products and services. And in the world of print and broadcast media, it was typically easy to tell the two apart. 1. Thought leadership, when treated as part of an overall campaign, does have the potential help to drive lead generation. 2. By coordinating content creation across channels, you can save time and resources by repurposing information to meet several different content needs. In short, if you promote your thought leadership articles properly (keep reading for more details on what that entails), they can help drive traffic to your website where you can convert those visitors into leads. Don’t discuss them on your business blog. I know I have said, repeatedly, not to make your business blog about yourself. (Most recently, it was one of 7 rules I laid out in this blog post.) But, you know what they say, rules are made to be broken or at least slightly stretched from time to time. This is one place you should stretch the rules a bit. When your bylined article is published, write a blog post about it. Share a link to the article in the post, offer a little extra insight about why that topic should matter to your readers, customers and prospects, and then include a call-to-action highlighting a related offer on your website. By writing a blog post about the contributed article, you are expanding the reach of the article itself, highlighting your reputation within the industry, and creating an opportunity for lead generation by including a related offer and CTA. One of the simplest ways to promote any type of content — from infographics to videos to blog posts — is social media. So why wouldn’t you use it to showcase your latest thought leadership article? Social media has the potential to reach a wide audience, so be sure to include it in your plans for promoting and maximizing your effort to place contributed articles. Share them directly on social media. Wait, didn’t I just say …? Here’s the thing — YES, you should promote your contributed articles through social media. But you SHOULDN’T share them directly from the publication’s website. Why? Because that would simply link interested social media followers and audiences back to the publication’s website. If you are thinking from a marketing perspective, and specifically from an inbound marketing perspective, the goal should be to draw traffic back to your own website. To achieve that goal, rather than directly sharing the contributed article itself, you share the blog post you wrote about the contributed article. When, when a social media follower clicks on the link, he or she is brought to your blog, where there is a CTA for an offer (lead generation opportunity! ), additional insight, AND a link to the actual publication. It seems like a small difference, but the difference in lead generation potential is huge. Assume sales already knows about them (or has no use for them). You may have been working over the course of a few months to identify publications, pitch article ideas, write the content, and then create the additional content (blog posts, social media updates, etc.) to promote your thought leadership article. Of course, you know about. But don’t assume that others in your organization are keeping tabs on the coverage and placement your efforts earn. 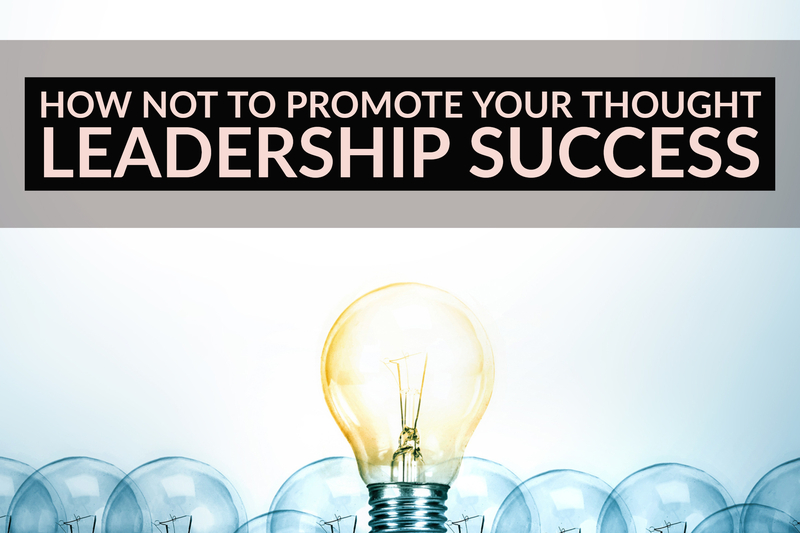 Be sure to let other departments know about successful thought leadership placement, especially your colleagues in sales. This type of content can be a strong tool for them to use in reaching out to prospects and customers with additional information and resources that deepen relationships or help build the case for a sale. Along with just letting them know about the bylined articles, be sure to ask them to share the blog posts in their own professional social media networks. It is also advantageous to be sure the sales department knows how your thought leadership articles fit into larger campaigns and what complementary content is available to them to use in their own lead follow ups. Don’t limit the return you receive — in brand awareness, industry authority, lead generation and sales — for the effort spent creating quality bylined articles for placement in industry publications. Make the most of your investment by thinking of the bylined article as one element of a comprehensive campaign, rather than a stand-alone piece. For more step-by-step instructions on making thought leadership a key element in your content marketing campaigns, download How To Get Your CEO Published — The Ultimate Guide To Getting Maximum Marketing Mileage From Contributed Articles.